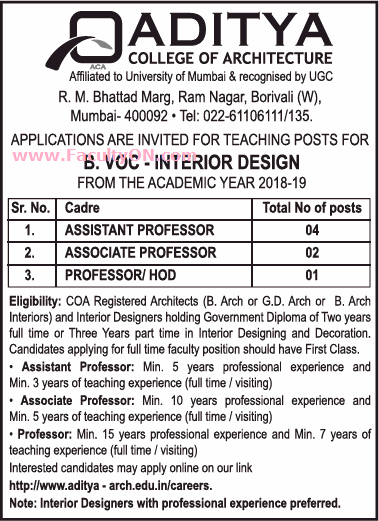 Aditya College of Architecture, Mumbai has advertised in THE TIMES OF INDIA newspaper for recruitment of Professor / Associate Professor / Assistant Professor / HOD jobs vacancies. Interested and eligible job aspirants are requested to apply immediately from 09th August 2018. Check out further more details below. About College: We have infrastructure comparable to the best in the world. We provide an ideal environment for exploring new ideas and encouraging young minds' creative and independent thinking. We facilitate faculty members to engage in research that combines both rigor and relevance.We promote twin qualities of a lifelong yearning for learning and a compassionate attitude towards fellow human beings..
COA registered architects (B.Arch or G.D. Arch or B.Arch Interiors) and Interior Designers holding Government Diploma of 2 years full time or 3 years part time in interior designing and decorations. Candidates applying for full time faculty should have first class.